You can download and try any of the programs available on the AVS4YOU.com website. There is no feature or time limitations for them, the only limitation is the watermark banner added to the output video files and the voice logo added to the output audio files. To avoid inserting a watermark/voice logo into your output files, you should purchase the subscription and activate the programs. Once you buy the subscription, you'll be able to use all the AVS4YOU programs during the subscription period. On our official website, click the BUY NOW link on the top. Select the subscription type you want to buy. The following two subscriptions are offered: 1 year and Unlimited. 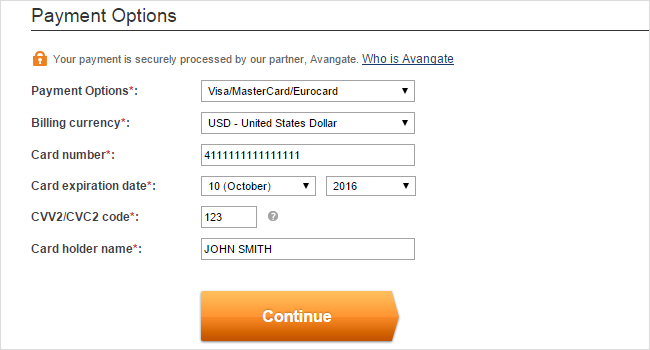 After you click on the selected option you'll be redirected to the Avangate payment page. In the Registration section of the Billing information page you can change the display language and the currency you want the price to be shown in. In the Quantity field, you can change the number of licenses you want to buy. Click the Plus/Minus buttons to change the quantity. The AVS4YOU software is licensed on a per computer basic. For example, if you set the Quantity to 2, you will receive two license keys and will be able to use the software on two computers and so on. If you have a discount coupon, check the corresponding box, copy the coupon code, paste it in the field that appears and click the Update button. The coupon will be applied and the discounted price will be displayed. Fill in the required fields in the Billing Information section: specify your Full name, City, Zip or postal code, Country, State or province, Email. The fields may differ depending on the selected Country. Please, pay special attention to the Email field, because all the information about your order as well as a license key will be sent to the specified email address. Note: If you represent a company, check the corresponding box. In this case you'll also need to provide the following information: your company name, address, phone number and fax number. For customers within the European Union the VAT ID may be required. Fill in the required fields in the Payment Options section. type in your name in the Card holder name field exactly as it appears on the card. Click the Continue button. You will proceed to the Confirmation and Payment page. 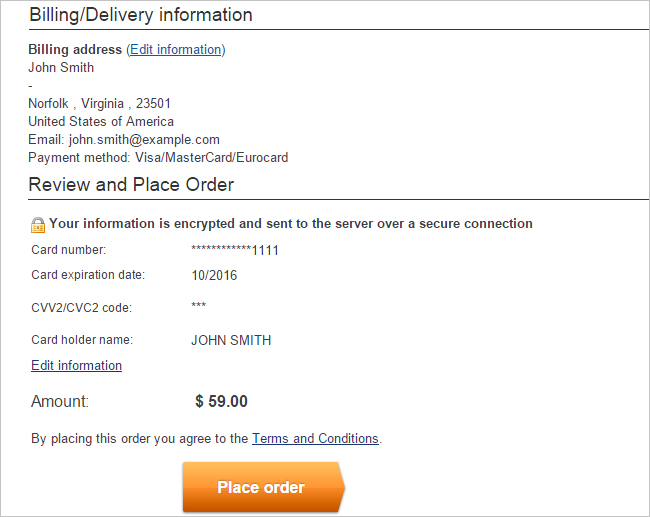 On the Confirmation and Payment page, verify all the specified information. Use the Edit information link to return to the previous step and change some data. If all the details are correct, click the Place order button. You will proceed to the Finish page with summary information on your order. Once your order is processed, you'll receive an e-mail from us, where you can find some instructions for installing and activating the AVS4YOU programs and your personal license key. You can also refer to our guide lo learn how to activate the AVS4YOU software using this license key.